A viewing of the classic comedy All of Me reminded Cinecultist (and trusty roommate LS) how much we love Steve Martin. We began to play the game "Have You Seen This Steve Martin Movie?" 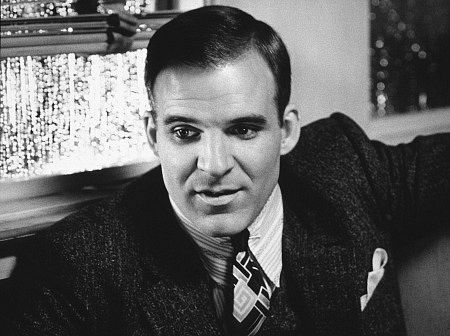 Some CC favorites include: L.A. Story, Dirty Rotten Scoundrels, and Dead Men Don't Wear Plaid. LS is partial to The Jerk and The Man With Two Brains as well as All of Me because Lily Tomlin is so delightfully queer. Steve Martin is the kind of comedic performer who doesn't rest on his laurels, he writes books, plays and has graced such classic television programs as "the Smothers Brothers" and "Saturday Night Live". He's even been in a Muppet Movie (credited as the Insolent Waiter). This alone allows CC to pretend that Bringing Down the House didn't really exist. Up next for Steve: film versions of his novel, Shopgirl and his play, Picasso at the Lapin Agile as well as an adaptation of one of CC's favorite childhood books, Cheaper By the Dozen.